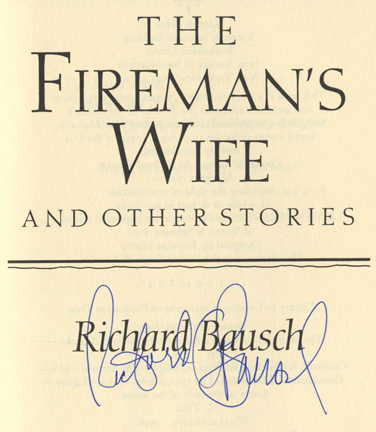 Nothing prepared me for the ending of Richard Bausch’s short story, “The Fireman’s Wife.” Just a couple of years into the marriage, Jane is experiencing deep regret over her decision to marry her firefighter husband. When Martin is not working long shifts with buddies Wally and Teddy, he is likely playing cards with them, drinking or doing drugs with them, or working on their shared passion of building and flying model airplanes. One night, a lumberyard goes up in flames while Martin and friends are on duty, and Milly’s dark dream comes true. Martin witnessed Wally’s death, and Martin’s own hands were badly burned in the process. Meanwhile back at home, an unhappy Jane has yet to learn this horrific news. Instead, she “finds herself in the bedroom, pulling things out of the closet and throwing them on the bed.” She is losing herself in the act of packing in order to leave Martin, and falls asleep on the clothes piled atop the bed. Her dreamless sleep is interrupted by the voices of fellow firefighters bringing a wounded Martin home. In his deep grief and pain, Martin notices Jane’s travel bag. She tries to distract him from talking about her leaving, and she devotes herself to caring for him. Her hands move deftly in intimate acts of service — loosening his belt so he can urinate, bathing him, dressing him, and tucking him into bed. She is still intent on leaving him, she thinks, just not now. “There’s no need to hurry….she realizes she can take the time to think clearly about when and where; she can even change her mind.” Having put him to bed, Jane waits for him to drift off. And then comes the story’s closing paragraph. At last he’s asleep. When she’s certain of this, she lifts herself from the bed and carefully, quietly withdraws. As she closes the door, something in the flow of her own mind appalls her, and she stops, stands in the dim hallway, frozen in a kind of wonder: she had been thinking in an abstract way, almost idly, as though it had nothing at all to do with her, about how people will go to such lengths leaving a room—wishing not to disturb, not to awaken, a loved one. Bausch, Richard. The Selected Stories of Richard Bausch. Random House Publishing Group, 2012.